A bit more on methods for whole-enterprise architecture – and for many other domains, for that matter. 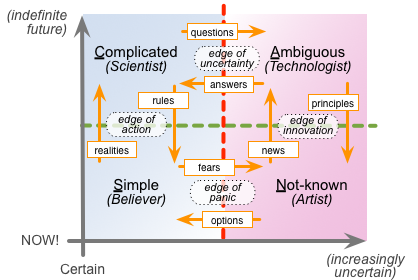 We need to take some care around keeping it simple, and maintaining clarity about meanings for the phase-labels, but otherwise it’s usable for any scope, any scale, any context, any content, across any iteration-timescale, fractally, from a few years down to a few minutes. Below that kind of timescale, though, even this structure starts to get a bit cumbersome… – in essence, it’s a set of emphases to apply within assessment and the like, rather than the means of assessment itself. 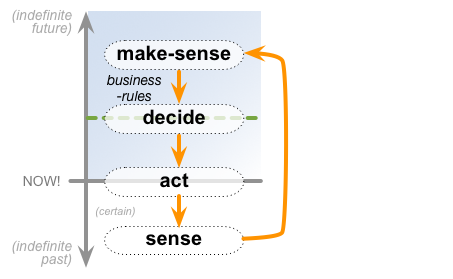 To understand what’s really going on – and how to do it better – we need to dig a little deeper into the underlying processes for sensemaking and decision-making. Again, this needs to be fully fractal, but this time right down to much tighter timescales, from minutes to seconds to sub-seconds and even below. To get at what’s really going on, it seems useful to build a series of crossmaps. 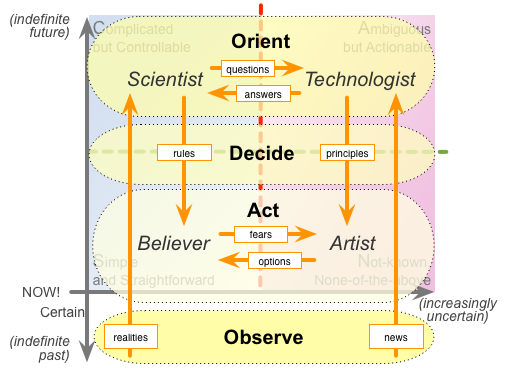 — We describe the sequence as ‘Observe, Orient, Decide, Act’, but Observe is actually in the past – identifying the outcomes of the previous iteration – whereas the next phase, Orient, is the first that is actually in the future, as a prelude to Decide and thence to Act. This ‘back to the future’ change of direction is one of the key determinants for the effective speed of the overall cycle. 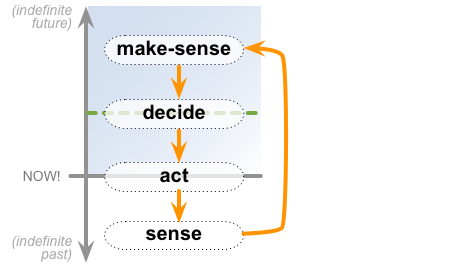 — Although many sort-of decisions may occur earlier, the key Decide takes place on the respective boundary between plan and action (the green dashed-line on the vertical-axis). 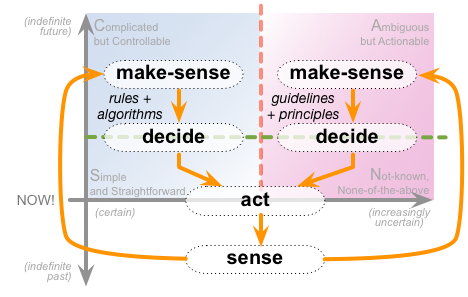 This Decide feeds rules to the Believer-archetype, to Act in Simple (predictable) contexts; and/or principles to the Artist-archetype, to guide each often-unpredictable Act within the inherent-uncertainty of the Not-known. — By definition, Act always occurs at the moment of ‘NOW!’ – though note that each apparent ‘NOW!’ is itself made up of an infinity of other ‘NOW!’-moments, fractally, and always moving forward. — Only Observe has any chance of being real – though even this can be somewhat subject to ‘echo-chamber‘ filtering, ‘policy-based evidence‘ and suchlike. Everything else relates to an imagined future, and by definition is inherently subject to assumptions, cognitive-bias, hype, wishful-thinking and more. — Sense is more than just ‘Observe’ – it must include looking inward at the inner, personal, subjective world, every bit as much as observing the nominally-‘objective’ external-reality. 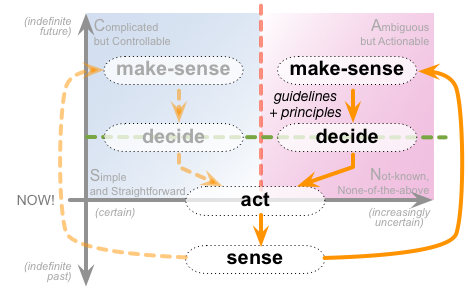 — Make-Sense is more than just ‘Orient’ or ‘Interpret’ – in addition to orienting or interpreting what is sensed in terms of the believed or known, it must often also find some way to create sense from the new or unknown. — Decision is more than selection of options from an hypothesis – it is often deeply fractal, sometimes more like deep-iteration around a chaotic-attractor in a fitness-landscape, than a Simple-style Yes/No choice. 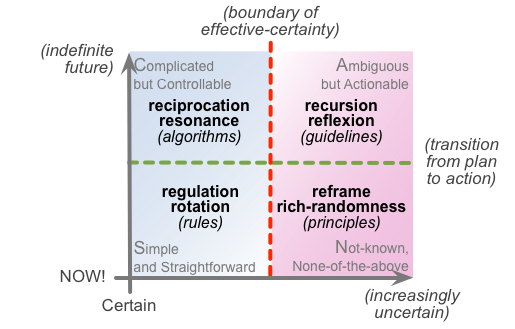 — Act is more than a single testable moment – as with Decision, it is often deeply fractal, and also across all of the asset-dimensions and decision-dimensions that apply within the respective context. However, in tightly-regulated or rule-bound contexts – such as in Taylorist-type organisations dominated by hierarchical ‘top-down’ decision-making – those people are in effect constrained to act no different from machines. The result is that all of the advantages of engaging humans in the work are lost, whilst keeping all of the disadvantages, limitations and fragility of the machine-only model – perhaps Not A Good Idea…? Remember too that, by definition, each Act takes place in the travelling-NOW – whereas Decide and Make-Sense both take place at some distance from that respective NOW. 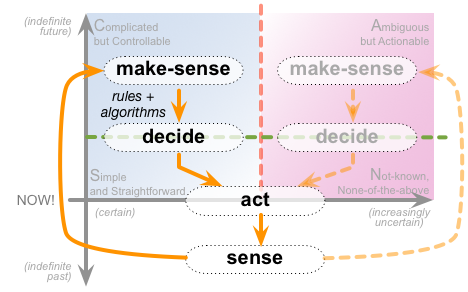 And the greater the distance from that NOW, the greater the risk that the sensemaking on which decisions should be made will get lost or filtered-down or reinterpreted by the fractality of other sensemaking and decision-making closer to the point of action. In practice, ‘above-the-line’ or ‘considered’ decisions will not be Acted on unless there’s some way to repackage them as real-time ‘below-the-line’ Decisions – hence the very real importance of work-instructions, rules, checklists, guidelines, principles, vision and all the rest, and the means by which ‘above-the-line’ decisions can be converted into those ‘below-the-line’ forms. 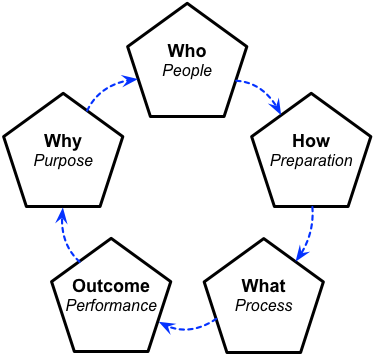 And finally, no, this SMDA cycle doesn’t claim to be a replacement for OODA, SIDA, PDCA/PDSA or any of the other well-known frameworks, or ‘better’ than any of them: it’s just another potentially-useful way of working with the same overall kind of context-space – nothing more than that. 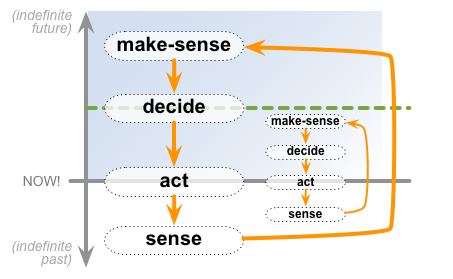 It does provide a useful crosslink with SCAN and suchlike tools for sensemaking and decision-making in whole-enterprise architectures, and it does provide clarity about what happens (or needs to happen) in the fine-detail of the suggested Five Element core-method for whole-enterprise architectures. But that’s about it, really – yet hope it’s useful, anyway. Over to you for comments and suchlike, if you wish? 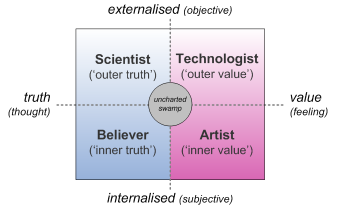 I wonder whether some exploration of analysis vs synthesis might be helpful here, as well. Good point, Peter – you’re exactly right about the need to cross-reference with analysis vs synthesis here. 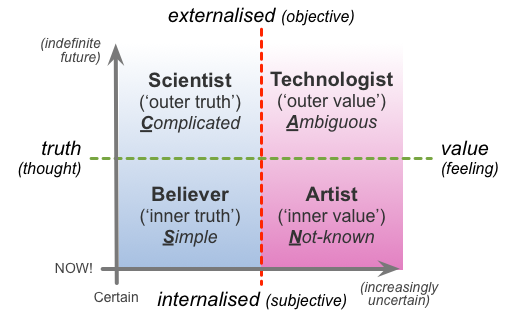 My understanding is that there’s some (emphasis: some) alignment of analysis to the left-hand side (Simple / Complicated) versus synthesis to the right-hand side (Ambiguous / Not-known), in the sense that the ‘natural’ tendencies for each would tend to go that way. But the whole thing is massively-recursive, and there are forms of analysis and synthesis that fit more with the respective ‘opposite’-sides, so it’s all a bit messy anyway. Useful as a quick rule-of-thumb pattern, but at risk of becoming dangerously overly-simplistic if we’re not careful, is the way I’d have to summarise it, I guess?